I believe I’ve been disinformed. Having come to this realization, I am now trying to pinpoint the source of my disinformation. After initial review, it seems that locating an ultimate source is going to be rather difficult, if not impossible, there being so many sources of disinformation that they wind up supporting each other, increasing in ever widening radii of concentric circles like waves generated by a stone thrown in an otherwise still pond, feeding off each other, each incomplete, adulterated piece contributing to a whole picture that winds up looking nothing like the genuine thing…sort of a decay from clear vision to the foggy-misty obfuscation of an abstract-impressionist painting. In visual art, this is a good thing, as we are able to insert ourselves into the painting. In informative media, this is anything but good, for our information about the world is skewed to the point that the events we think we have an understanding of would not recognize the narrative we cling to steadfast because we think we have the proper information. That is the nature of disinformation. Governments have used disinformation for a long time. Most of us conservative types immediately think of the Soviet Union’s KGB when we suspect disinformation, Nikita Kruschev and Yuri Andropov sitting around thinking of things to purposefully disinform us about, as if it were they who had a monopoly, a patent, an exclusive right to the propagation of malformed information, or disinformation, or propaganda. We’d be victims of our own disinformation if we held to that too closely, for disinformation was not invented by the Soviet KGB, though they seemed to engage in it more than they had a right to. We have had plenty of disinformation flung at us by our own government, and still do. It’s an ancient practice. “We don’t have enough bricks to finish building the people’s tomb,” the chief architect may have reported to Pharaoh Ramses II, referring to the new tomb project as ‘the people’s tomb’. He said this immediatey after the scheduled monthly progress meeting between the owner, architects and engineers, the general contractor, and the various and sundry subcontractors and suppliers, was called to order. Everyone at the table, including Ramses II, turned to look at the authorized brick supplier, Hebrew Delta Brick Company’s vice president for customer service, Monkeshine Butthops. Monkeshine could hardly stand the Pharaoh’s gaze. He flushed and shrugged his shoulders, hoping he could play this smooth and land the OK to import the bricks, but one never knew with Ramses II, who mostly sat there silently, staring down anyone who dared give any excuses for not adhering to the construction schedule. Monkeshine knew that he must stand the scrutiny and not waiver. Only then could he could pull this off. This was a cost-plus job, therefore, the more cost, the more plus. Imported bricks were just the ticket he needed to boost his commissions to pay for his son’s tuition at Nile State University/Memphis, and perhaps even get him a condo for his trips to Memphis to attend Nile State football games. He must play his cards right: if not, then he and junior could be counted among the harried brick makers, or worse. Monkeshine cleared his throat and began, wavering at first, but gaining confidence as soon as he realized that the Pharaoh was not going to call for his head. Monkeshine was sticking word-for-word to the pre-arranged script agreed to with the chief architect. Everyone looked reflective, pausing to consider what had just been said. Everyone knew that a labor dispute had resulted in straw shortages, which greatly hampered brick production. Driven to the brink, many of the workers were arguing for better working conditions, with some supervisors even balking at the workload and schedules they were expected to keep. The whole brick industry was descending into chaos. The people were getting weary of the expense of this monument to themselves being built by Ramses II, which seemed to have a lot of artwork depicting the adventures of Ramses II and very little to remind the people that this was their monument. This meant he would get that condo. It also meant that the granaries would be emptied as the Mesopotamian merchants were not willing to take an Egyptian letter of credit for the bricks, and all transactions had to be in kind at fair market value since they were, rightfully, suspect of Egyptian currency, which had lost nearly 50% of its value within the past year, as measured against other currencies on the Bureau of Currency Exchange (BCE) international monetary markets. People were bound to go hungry in Egypt as a result of this, but Monkeshine and his family were not going to be among them, nor were any of the other people at the table, at least not until this project was over. So the deal to import the bricks was authorized by the proper contract change orders, and wheels on oxcarts all over known world were beginning to turn on this massive mobilization to move sun-baked mud from one arid place to another. “What do we tell the people when their children are hungry and the granaries are empty?” the prime minister later asked Ramses II. “Tell them it is the fault of the Hebrews and that evil step-brother of mine, Moses,” Ramses II spat as he replied. And so it was done. The rest of the story has passed down to us from antiquity, minus the behind-the-scenes motivations indicated above. That is always the way we get the story, as everyone tells it from their own point-of-view, or from the the position of the betterment of their own self-interests whether those be money, power, fame, glory, etc., all of which are powerful motivators that humans succumb to…ancient humans, and modern, altruistic humans. None are exempt. None can be. Where’s the real story? Where’s the real truth? All the brick-making company executives gathered round and gasped at this unorthodox request.. Outer Mesopotamian regulations would prohibit this type of false labeling and export shenanigan. They frantically discussed among themselves what to do. “What good will that do?” one of the younger brickmakers asked. 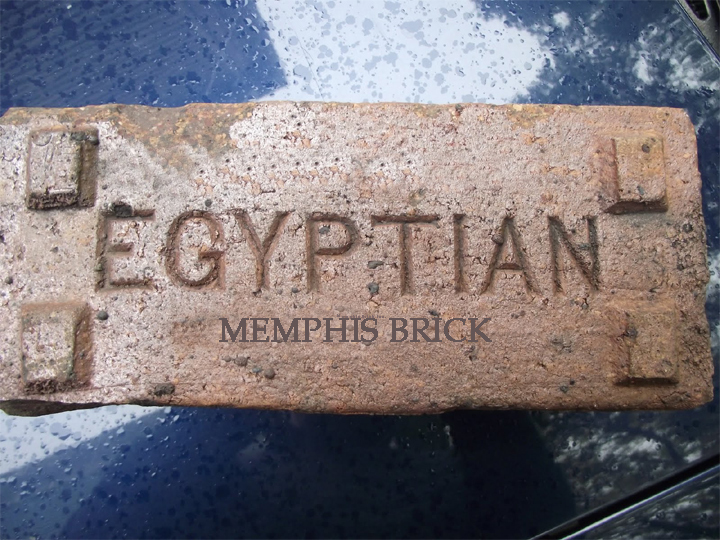 Remarkably, though millions and millions of bricks have been found bearing the legend “Egyptian” and “Memphis Brick”, no brick-making facilities have ever been unearthed near the site of ancient Memphis, even though archaeologists have searched for clues for a century. The archaeologists have many explanations for this, all of them wrong. I suppose no one thinks that sophisticated business models existed until this modern age. We feed on disinformation, then regurgitate more disinformation. Somewhere, the truth is out there, embedded in a brick, perhaps, or inscribed on one if the discerning eye can get past the legend on its surface. If you can’t get past the surface, legitimately, it is nothing to invent whatever is needed to explain anything the way you need it explained for your own purposes. People have been doing it as long as they have needed to explain things, which no doubt occurred sometime shortly after the first marriage. So you have been informed. Or disinformed.